For the second straight day, Chicago Bears quarterback Mitchell Trubisky was limited in practice at Halas Hall. For the second straight day, Chicago Bears quarterback Mitchell Trubisky was limited in practice because of an injury to his throwing shoulder. Trubisky’s status for Sunday’s game against the New York Giants is still up in the air, but he says he is feeling better and that he’s getting closer to returning to the field with each passing day. Bears head coach Matt Nagy said that Trubisky was able to do some light work on the practice fields at Halas Hall, but that he still has not been cleared to throw because of the injury. 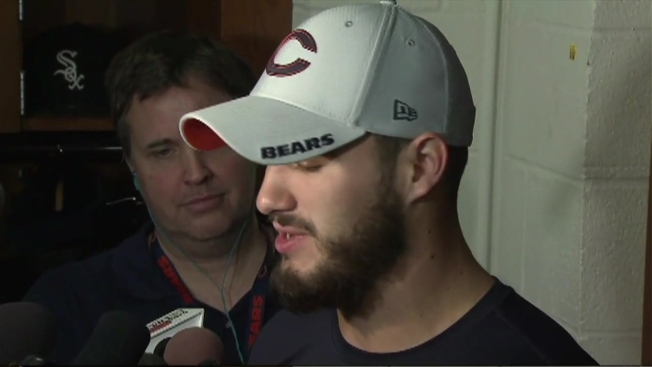 During an availability at his locker, Trubisky said that he believes the injury occurred during the Bears’ Week 11 win over the Minnesota Vikings. The quarterback said that he awkwardly landed on a dive in the fourth quarter, and that his arm got caught underneath him. The Bears’ injury report on Thursday was identical to the day before, with running back Benny Cunningham (ankle), defensive tackle Akiem Hicks (Achilles) and defensive back Sherrick McManis (hamstring) all missing the workout. Linebacker Aaron Lynch and tight end Adam Shaheen were both able to participate for the second straight day.